Staying on our budget for the month is difficult to do with the ever rising costs of food in our area. I am sure we are not alone in the rising costs of food and it can really cut into a budget. 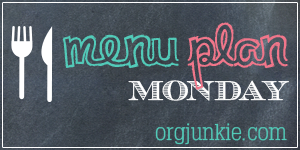 I find Menu Planning to be my saving grace every week. I plan my meals for the week and even sometimes on a Sunday you will find me cooking up a storm with the chili, soups and stews for the week so they are ready to eat and I pack the rest away in the freezer for quick meals on those busy days. Do you plan ahead when you are making meals?